Both teams involved in the I94 rivalry come into this weekend’s series with losing, though, semi-competitive records in their respective divisions. Let’s hear one for our sponsor this weekend…parity!!! The Crew are the more respectable of the two, checking in at 16-22, good for 4th in the NL Central, and only 6 games back. The Twinks are a ghastly 12-26, good for the worst record in baseball, and yet, are still only 10 games back in the AL Central. Only might seem a bit “glass half full,” but, consider that they would be 13 games back in the AL East or NL West. The Twins come into this weekend’s series hot, fresh off their first sweep of the season. Will they get to use their brooms again this weekend? In terms of momentum, amazingly, the Twins have that market cornered right now, winning their last two games. Sweeping the division rival Tigers in Detroit. The Crew have lost two in a row and four of their last five. However, that is nothing that a little home cooking with an ancient rival won’t fix. The Crew are 4-2 against the Twinks the last two years and have been particularly dominant in Milwaukee. The pitching sets up nicely for the Brewers who will run Estrada, Yo, and Greinke to the hill in this weekend’s tilt. The Twins are countering with Scott Diamond (more on him later) Carl Pavano, and Jason Marquis. Needless to say, particularly with Pavano and Marquis, the Miller Park scoreboard operator should consider asking for a bonus this weekend, he is likely going to be working overtime. In fact, does the scoreboard at Miller Park have an infinity symbol? Marquis has been pitching lately like a guy challenging that frontier. To call his recent outings glorified batting practice is an insult to batting practice pitchers everywhere. That lack of quality starts, in large part, has driven the Twins into a youth movement. Hence, Scott Diamond. Diamond is a 6’3″ lefty who has dominated in his first two starts since his call-up on May 8th. Diamond joined fellow youngster, P.J. Walters in the rotation as the Twins, who are using the spaghetti method of building a line-up, want to see what they have in these young arms. The youth movement has been even more prevalent on the offensive side of the ball. Of the Twins 12 position players who see the most innings, 8 of them are not yet 30 years old and 5 of them are not even halfway through their roaring 20s. The brightest star of these diaper dandies has been SS Brian Dozier. Dozier is hitting almost .300 with 5 extra base hits while playing stellar defense. He really has been a sorely needed spark and, should there be any kind of turn around, he will definitely be considered the guy who help initiate it. 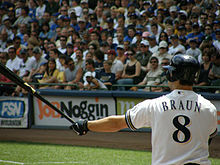 FedEx snafu aside, at least the Crew’s nine figure guy Braun is delivering. Not sure Twins fans are as happy with their guy Mauer at the moment. The Crew have yet to stoop to the Twins level of desperation, refraining from calling up all their young prospects. Instead, sticking with the “veterans” (Braun, T-Plush, Weeks, and Hart). Although, even those veterans are still relatively young. Brewers fans should be happy about the core of young players that the organization has to build around. And, on top of that, the Crew do have some guys in the minors who look like they could be contributing soon. Pitcher Tyler Thornburg is dominating at Double A. His 1.91 ERA and 9.8 SO/9 are downright filthy. If the back end of the rotation continues to struggle, he might just force the Crew’s hand. His teammate, Khris Davis, is also raking at Double A. Stuffing the stat sheet in all the counting categories while roaming the OF at Huntsville. Though, unless the Brewers decide to trade Plush or Hart, Davis probably will not get the ABs he needs to justify a pre-September call up. As of right now, only the Twins have fully embraced the youth movement. It would not shock me to learn that their is some sort of underground expressway from Target Field to Rochester. Barring a turn around, hopefully the Twins see enough out of their young guns that they can be player at the trade deadline in terms of moving talent (Span, Burton, etc.) for additional prospects. The Brewers have the prospects knocking on the door to follow suit and embrace their own youth movement. Though, the memory of last year’s run to the NLCS may cause them to hang on to hopes of another playoff run a bit longer than is appropriate. The nice thing is, regardless of the new faces, the rivalry goes on. It is still Twins v. Brewers. And that always makes for a good time. This entry was posted in Home, Twins v. Brewers and tagged AL Central, Brian Dozier, Corey Hart, Denard Span, Detroit Tigers, FedEx, I94, Jared Burton, Joe Mauer, Khris Davis, Milwaukee Brewers, Minnesota Twins, NL Central, P.J. Walters, Ryan Braun, Scott Diamon, The Crew, Twinks, Tyler Thornburg. Bookmark the permalink.